A number of bed-in-a-box startups have taken different approaches to selling their mattresses and bed ware in the last year. Casper and Tuft and Needle, for instance, launched their own branded physical store locations. However, Purple, a mattress startup out of Utah that recently merged with a New York shell company, took a different approach, instead striking a distribution deal with mattress retail giant Mattress Firm. Note, Casper also has distribution deals with West Elm and Target stores. California, depending on how the sales go in our nation’s capital. 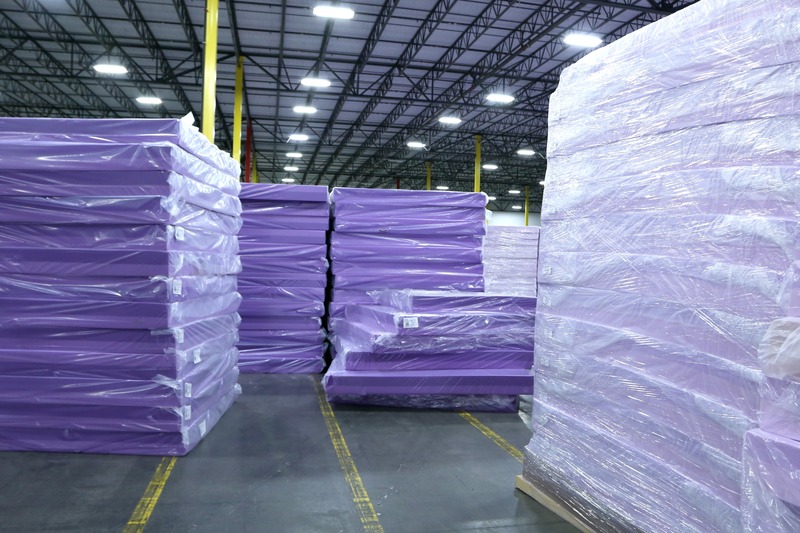 Thousands of Purple’s mattresses stacked up inside Purple’s 574,000 square-foot warehouse. It’s not clear how that is different from the current mattresses but Purple has offered to let me try it out sometime and find out for myself. I’ll let you know if and when that happens. supportive mattresses on the market,” Purple CEO Sam Bernards said. “We continue to improve our mattresses to help people feel better and reduce uncomfortable pressure using our proven sleep science, which is revolutionizing the mattress industry. The news comes just as Black Friday deals are starting to heat up. Purple, for instance will throw in a free pillow with your purchase (while supplies last) But there are plenty of other (and better) deals to be had for those in the market. According to popular mattress review site Sleepopolis, most other online mattress companies are offering something in the range of $100-$300 off bed-in-a-box orders if you buy today. Mattress startup Leesa is offering $125 off plus a free pillow when you order and Brooklyn Bedding (the mattress I happen to have) is offering $300 off for its Aurora mattress. Be sure and check those out and others today.